It could be argued that this would go under games but because of how the two dolphins I have show different results I'm now very confused. 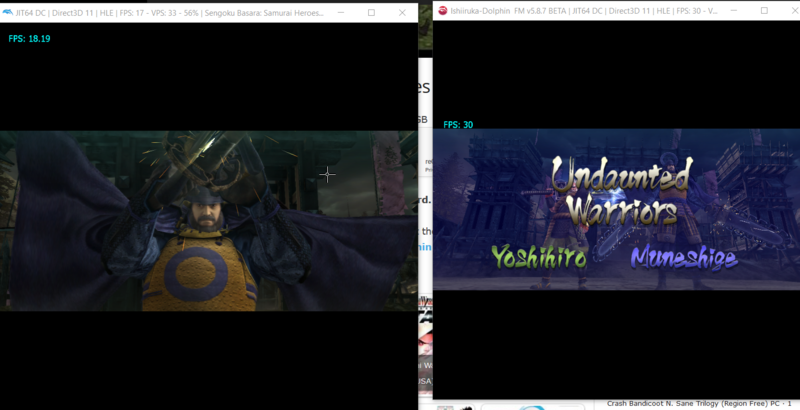 As shown in the image, I used the latest version of Dolphin 5.0-8512 and used Ishiiruka-Dolphin FM 5.8.7. When I played on Dolphin 5.0 the game would lag hard unless I used Direct3D 11 for the graphics but even then it would still lag during game play with frame drops ranging from 10-25. When I used the Dolphin FM, Which I got from Smashladder.com, the lag that I got before during game-play was greatly reduced and I could even play it in 1080p which was a big change from the Dolphin 5.0. The problem is when I played on Dolphin FM there was a blue screen that would cover the background of the characters. During the CGI cut-scenes, the game was fine but once in-game cut-scenes played, you would see the blue screen from the image I showed of Dolphin FM. This did occur during Dolphin 5.0 until I changed the ISO but apparently it is now occurring in Dolphin FM even though all the settings were the same except increased quality. I've tried messing with other settings but the outcome remained the same. Another slight difference was I couldn't download Gecko codes from Dolphin FM while Dolphin 5.0 did. If anyone can help me fix the blue screen or at least find a way to make Dolphin 5.0 run as smoothly as Dolphin FM it would be very helpful. I would have addressed lag from Dolphin 5.0 on the subject but I'm prioritizing Dolphin FM for now in terms of problems since I know that my pc can run games at high quality consistently and it wouldn't have fit in the title. If you're using FM then go ask them for help, it's not one of our builds. (08-01-2018, 12:20 PM)JMC47 Wrote: If you're using FM then go ask them for help, it's not one of our builds. You have a fair point but do you think there's a good reason why the fm seems to run the game better as opposed to 5.0? Also the website where I got it, from you can't really ask anyone. You'll just be one of the thousands of questions unanswered. Who knows. FM is based on Ishiiruka in the first place, which makes tons of accuracy sacrifices in the name of speed and maintaining better compatibility with really old hardware and software. And even then it's heavily modified to do things to Melee, so you really shouldn't be playing anything except for Melee on it. Try using Ishiiruka and see if it runs as well as FM.